Tiger Woods botched a bundle of front-nine birdie chances Thursday at Augusta National but was pleased with a two-under par 70 that had him firmly in contention at the Masters. The 14-time major champion, trying to capture his fifth green jacket and first major title since 2008, shot the same score he did in the first round of his Masters victories in 1997, 2001 and 2002. "It's not a bad start," Woods said. "We still have a long way to go. Tee off late tomorrow and the wind's supposed to be up, so I have my work cut out for me the rest of the week and so does everyone else." But the 43-year-old American superstar might have fared even better had he taken advantage of short putts on the front nine that foiled what could have been only his second sub-70 opening round at Augusta after a 68 in 2010. "I felt in position to make birdies today," Woods said. "I missed a couple on the front nine, a couple short ones, but overall I felt my speed was really good all day." The mix of awe and wonder Woods inspired in younger days under the towering Georgia pines returned in his first Masters appearance since contending at last year's British Open and PGA Championship. Nagging back woes that weakened him for years appear to have been solved by spinal fusion surgery, although he remains unable to practice as long or intensely as in his Tigermania days. "The whole idea is to try and peak for four times a year," Woods said. "And so I feel like my body's good and my game's good. It's sharp, so just got to go out there and execute and I got to do the proper things and if I do miss I miss in a proper spot." It's that course knowledge that made Woods an oddsmakers pick this year along with Rory McIlroy, as well as form that saw him win an 80th career US PGA title at the Tour Championship to end a five-year victory drought. And it didn't hurt for Woods to see Germany's 61-year-old Bernhard Langer, the Masters winner in 1985 and 1993, match the second-best opening round in 24 starts since his last green jacket with a 71. "I mean, there's a 61-year-old up there on that board. He knows how to play this golf course," Woods said. "So it's a matter of missing the golf ball in the correct spots and picking your spots and when to be aggressive." 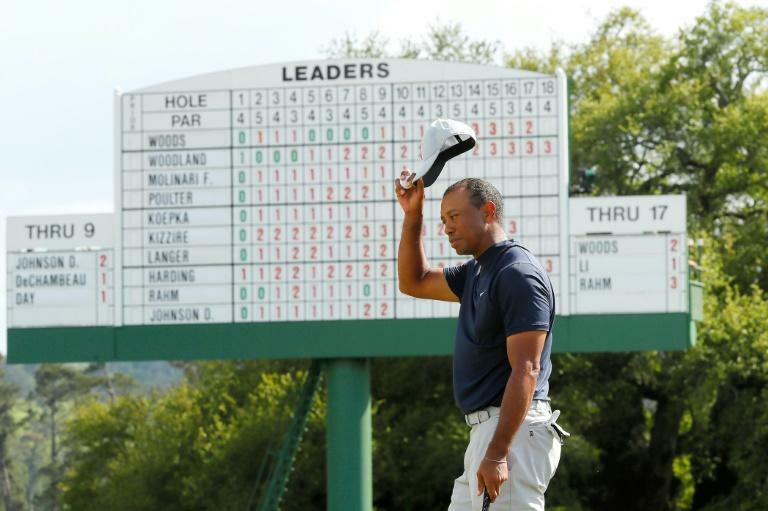 Woods, who last won the Masters in 2005, dropped his approach to four feet and sank his birdie putt at the par-5 second hole but missed a five-foot putt to bogey the par-4 fifth and squandered birdie chances from seven feet at the par-3 sixth and nine feet at the par-5 eighth. Woods, ranked 12th, found his putting touch by sinking a five-foot birdie effort at the ninth, two-putted from 53 feet for birdie at the par-5 13th and sank a 25-foot birdie putt at the par-4 14th to briefly share the lead at 3-under. But he was undone when he flew over the green at 15 and his ball stopped against a root, producing what he called his toughest shot of the day. "I laid up on my chip to make sure I didn't catch the root and blade it in the water," Woods said. "Had an easy little up and down from there and was able to move on with par."